Abbreviated Title: J. Internet Comput. Serv. 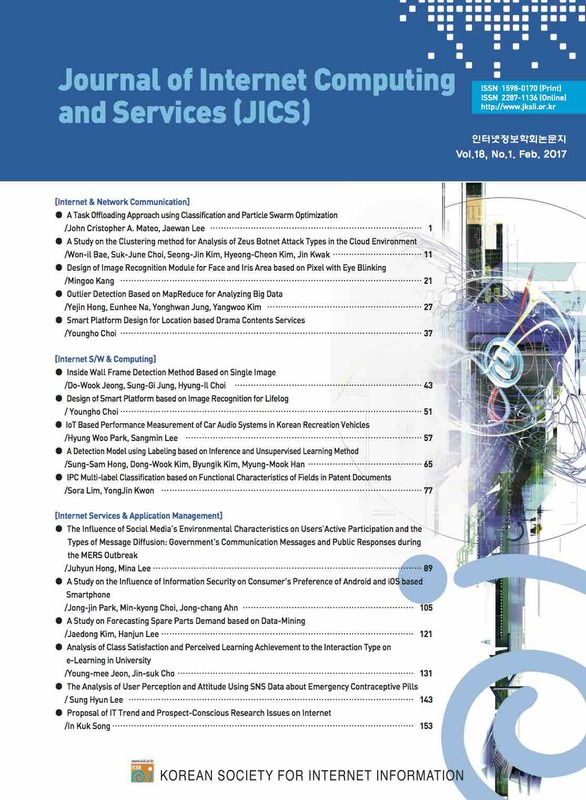 Journal of Internet Computing and Services (JICS) is the official journal of The Korean Society for Internet Information. It was launched in November 2000. The journal continued as the Journal of Korean Society for Internet Information (JKSII) until September 2013. The journal english title has been changed Journal of Internet Computing and Services (JICS) in October 2013. Journal of Internet Computing and Services (JICS) is a peer reviewed bimonthly journal that it has been evaluated as the expert journal presenting the study of the related field, related technology and industrial research result such as internet communication integrating the internet and the information communication technology, security, media, software/engineering, intelligent system, education/application, IT Policy&Service, Internet Society and etc. Keywords: 카테고리 자동 추천, 온라인 B2B 소핑몰, 지도학습 기반 머신 러닝, 형태소 분석, Naïve Bayes 분류., Catalog Entry Auto-Recommendation, Online B2B Shopping Mall, Supervised Machine Learning, Morphological Analysis, Naive Bayes Classification Algorithm. Keywords: Catalog Entry Auto-Recommendation, Online B2B Shopping Mall, Supervised Machine Learning, Morphological Analysis, Naive Bayes Classification Algorithm.